Mindika Moments: I've joined the Quinoa craze...and I'm not sorry! I've joined the Quinoa craze...and I'm not sorry! Has everyone tried Quinoa yet? There are recipes for Quinoa everywhere and the health benefits of this popular little grain (is it a grain??) have shot this little food into super stardom. Several months ago, my sister shared this recipe with me. I was so excited to try Quinoa that I ran out and bought it. I had planned on making it within days of my purchase, but I got side tracked for some reason and the Quinoa stat in my pantry for what seems like forever. Until a couple weeks ago when I was cleaning out my pantry and I found it hiding in the back. I immediately put it on my menu again, and this time followed through. It was amazing. I added chicken to make it a "man meal" for my husband. But we both absolutely loved it. So if you're one of the few (like I was) that haven't delved into the Quinoa craze, this is a good time to jump on the wagon. 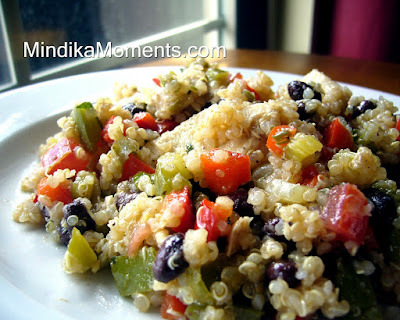 And if you are already a Quinoa fan, give this recipe a try! 1. Soak the quinoa in cold water for 30 minutes. Rinse thoroughly in water several times, then drain well. 2. Place in 2 qt. pot with 1 ½ C. water and salt. 5. Add the celery and the green and red peppers and sauté briefly to soften the veggies. 6. Add the cumin and coriander, cook and stir for about 2 more minutes allowing the spices to absorb into the veggies and chicken. 7. Blend all the ingredients for the dressing in a blender, with a whisk or shake in a jar. 8. Gently combine the chicken and veggies with the tomatoes, black beans, quinoa and dressing in a large mixing bowl. 9. Add salt & pepper to taste. Stir in cilantro and scallions. 10. Serve warm or cover and chill for later.